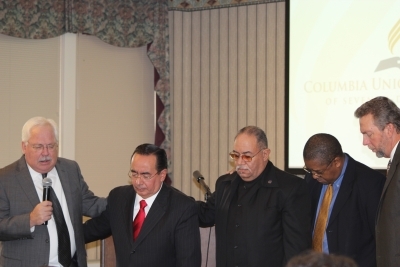 Pictured below: Pictured in prayer are (left to right) Rob Vandeman, union executive secretary; José H. Cortés, New Jersey Conference president; Henry J. Fordham, Allegheny East Conference president; Seth Bardu, union treasurer; and Dave Weigley, union president. The vote followed a video presentation from the New Jersey Conference, which shared multiple stories of Seventh-day Adventists coming from inside and outside the state to help community members hurting as a result of the storm. One group, students at the Heritage Academy, came from as far away as Tennessee to help. “If you think kids just want to just text, you are wrong,” Cortés said standing up during the video presentation to point out how eager the students were to help. Cortés also reported that the conference has pulled their old conference office building off the market and is now using it as a base of operations for Adventist Community Services Disaster Response. Potomac Conference officers also responded with a pledge to provide $20,000 to help with the effort. At the North American Division year end meetings a week ago, officers announced that they will appropriate $500,000 to the Adventist Community Services (ACS) Hurricane Sandy Relief Fund.” Additionally, the General Conference gave $200,000, the Atlantic Union Conference gave $30,000, the Guam Micronesia Mission gave $20,000, the Pacific Union Conference gave $10,000 and the Southern Union Conference gave $10,000 in support of Sandy relief efforts. This brings the total Adventist corporate giving to more than $800,000 but doesn’t include monies collected during two special “Sandy relief” offerings taken in churches across the division. Committee members also heard several other reports including one from Seth Bardu, union treasurer. He reported that tithe was up by 1.05 percent for the month ending September 30, compared to the same time last year bringing the total for the three quarters to $83.2 million. However, compared to the same time last year, the World Missions Fund was down by 1.15 percent with a total of $1.6 million. The Potomac Conference led the union in tithe dollars totaling $22.1 million. Allegheny East followed closely with $21.5 million in tithe. Next came Chesapeake Conference members who returned $11 million in tithe. Bill Miller, president of the Potomac Conference, said it was a joy to see how creative his members were in their ministry outreach. This year the New Market (Va.) church is hosting Journey to Bethlehem, a live interactive dramatization of first century Bethlehem held over the Christmas holidays. He also reported that 41 Hispanic churches are participating in a mega evangelism week and two church plants are slated for Leesburg and Dulles, Va.